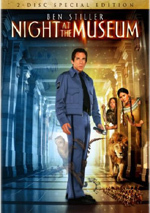 Blessed with a fun – if derivative – concept as well as a nice mix of action and comedy, 2006’s Night at the Museum became a massive hit. When a movie earns $250 million and turns into its year’s second-biggest hit, it usually will spawn a sequel. That’s especially when the idea behind the flick offers nearly limitless opportunities for exploration. 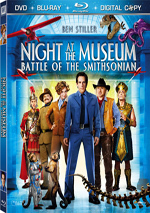 Night at the Museum: Battle of the Smithsonian appears in an aspect ratio of approximately 2.35:1 on this Blu-Ray Disc. This was an attractive presentation but not a stellar one. Overall sharpness worked well. I thought fine detail in wide shots could be a bit lackluster, but that was a bit of a nit-pick. While definition wasn’t stellar, it remained very good. No issues with jagged edges or shimmering occurred, and I noticed no edge enhancement. Source flaws weren't a problem either. Like the first film, Battle went with a warm, golden tint. Within those constraints, the colors looked lively and full. No issues with runniness or messiness resulted. Blacks were dark and deep, while shadows demonstrated nice clarity. This became a positive presentation. As for the DTS-HD MA 5.1 soundtrack of Battle, it boasted just enough action material to make it succeed. This wasn’t a super-spectacular kind of film, however, and I thought it downplayed action more than the first flick – at least for its first half or so. The story provided a wider array of engaging pieces as it progressed, but it lacked the consistent spread and involvement found during the original movie. How did the picture and sound of this Blu-ray compare to the film’s DVD version? Both demonstrated improvements, especially in terms of visuals. For a standard DVD, that image looked good, but the Blu-ray presented a much tighter image that also boasted livelier colors. Auditory improvements were as obvious, but they existed. I thought Blu-ray’s lossless mix was more engaging and dynamic. It still wasn’t good enough to jump to “A-“ level, but it seemed more involving and vivid. Scavenger Hunt Mode offers a trivia game that runs along with the movie. This presents two questions at a time and requires the player to spot corresponding items onscreen. You can play at either “easy” or “hard” levels. I went for “hard” and didn’t think it was particularly difficult, so I assume “easy” must be very simple. Anyway, this is a moderately engaging contest with no obvious payoff. When you fill the eight selections per tablet, you see a goofy little piece of animation. However, the final table ended with two empty slots. I guess I missed something along the way, though I’m not sure how that happened since I correctly answered all the questions presented. Whatever the case may be, this becomes a minor piece of fun. Next comes a program entitled The Curators of Comedy: Behind-the-Scenes of Night at the Museum: Battle of the Smithsonian. In this 27-minute, 52-second show, we hear from Levy, production designer Claude Pare, and actors Ben Stiller, Amy Adams, Robin Williams, Bill Hader, Hank Azaria, Chrisopher Guest, Steve Coogan, Owen Wilson, Ricky Gervais, Jon Bernthal, and Alain Chabat. They chat about sets and shooting at the Smithsonian, cast, characters and performances, and Levy’s work on the set. Note that “Curators” also appears on the single-disc DVD. Oddly, that version runs about eight minutes shorter than this one. Why did they edit it for the DVD? I have no idea. 12 Deleted Scenes fill a total of 26 minutes, 44 seconds. These include “Out of Town Emergency” (0:14), “Brunden: The Director’s Cut” (5:38), “Meet Ivan, Napoleon and Al Capone (Extended)” (3:48), “Ivan Interrogates Larry” (5:28), “World Twister” (1:14), “Capone Gets Inspired” (0:51), “Custer’s Plan (Extended)” (2:30), “How Many Bad Guys Can You Fit In an Elevator?” (0:46), “Moon Rover” (1:33), “Takin’ ‘Em Down, Gangster Style” (1:13), “Larry’s Pep Talk to Custer (Extended)” (2:23) and “Alternate Ending” (1:05). While we don’t lose any comedy gold here, some of these are reasonably entertaining. “Brunden” goes on so long that it actually becomes funnier due to the absurdity. The others are less interesting, though I like the confrontation between young and old versions of Capone. Many featurettes follow. Phinding Pharaoh lasts four minutes, 50 seconds and provides notes from Levy and Azaria. They discuss the path to Azaria’s performance, and we hear the actor’s unused ideas. Those test clips make the clip fun to see. Next comes Historical Confessions: Famous Last Words. It runs six minutes, 29 seconds and features comments from the actors in character. We hear from Bill Hader/General Custer, Alain Chabat/Napoleon, and John Bernthal/Capone. It’s a cute piece with some comedy value. Under Directing 201: A Day in the Life of Director/Producer Shawn Levy, we get a 19-minute, 19-second reel. We follow Levy through a day on the shoot and also hear from his assistant Regina Taufen, AD Josh McLaglen, script supervisor Diane Durant, and VFX supervisor Dan DeLeeuw. I enjoy this kind of program when it includes lots of footage from the set, and that’s what happens here. The show takes us behind the scenes in a satisfying manner. During the five-minute, 41-second Museum Magic: Entering the World of the Photograph, we hear from Levy, DeLeeuw, and Adams. We learn about the techniques that allowed the characters to enter the famous VJ Day Eisenstadt photo. We get some nice details in this quick piece. After this we locate Cavemen Conversations: Survival of the Wittiest. The show lasts four minutes, 18 seconds as it presents a panel chat in which three cavemen answer questions from an off-screen interviewer. Since their answers consist of nothing more than grunts and gestures, the joke gets old quickly. With Secret Doors and Scientists: Behind-the-Scenes of the American Museum of Natural History, we get a 15-minute, 58-second featurette. It offers notes from American Museum of Natural History president Ellen Futter, senior VP/paleontology provost of science Michael Novacek, senior project manager/exhibitions Steve Quinn, head conservator/anthropology Judith Levinson, director/Sackler Institute of Comparative Genomics George Amato, paleontologist/human origins research scientist Will Harcourt-Smith, curator/icthyology Melanie Stiassny, curator/herpetology Darrel Frost, curator and chairman/paleontology Mark Norell, collections manager/fossil amphibians-reptiles-birds Carl Mehling, senior fossil preparator/vertebrate paleontology Ana Balcarcel, astrophysicist/Hayden Planetarium director Neil deGrasse Tyson, and night shift watch manager Gary Louhisdon. Through “Secret”, we get a look at New York museum and learn at the work behind the scenes. This program seems a little out of place here – shouldn’t it be on the Blu-ray for the original movie? – but it still provides a decent examination of the work required to maintain a museum. Under Show Me the Monkey, we get three clips. These include “Monkey Business” (5:04), “Primate Prima Donnas” (6:27) and “The Secret Life of a Monkey Movie Star: Life Off Camera” (6:27). During these, we get notes from Levy, Stiller, Gervais, Hader, Adams, Williams, Chabat, and monkey trainers Tom Gunderson, Tony Suffredini and Mike Alexander. The featurettes show us the work done by animal actors Crystal and Squirt. Some interesting info results, but expect a lot of fluff along the way. We see more of the director via the one-minute, 57-second Gangster Levy. In this short clip, we see a short faux gangster film clip that stars Levy and McLaglen; it turns up in the background at the Al Capone exhibit. This is a fun little extra. We wrap up Disc One with two Fox Movie Channel Presents specials. We find “Making a Scene” (9:36) and “World Premiere” (5:29). Across these, we hear from Levy, Garant, Lennon, Pare, McLaglen, Williams, Azaria, Adams, and actor Clint Howard. “Making” looks at the specifics of shooting a big scene at the Air and Space Museum, while “Premiere” details the flick’s debut at the Smithsonian. “Premiere” is a negligible piece of fluff, but some decent notes emerge in “Scene”. A few ads open Disc One. We get clips for Avatar, Alvin and the Chipmunks: The Squeakuel, Percy Jackson and the Olympians: The Lightning Thief, Ice Age: Dawn of the Dinosaurs, and Flicka 2. Under Trailers, we get an ad for Aliens in the Attic. No trailer for Battle appears here. 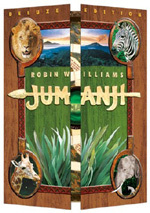 A second disc offers a Digital Copy of the movie. This allows you to transfer the film to a computer or portable gadget. Party up! Finally, a third platter provides a DVD Copy of Battle. If you want to own Battle but aren’t yet Blu-ray capable, it’s a good bonus. I’ve certainly seen worse sequels than Night at the Museum: Battle of the Smithsonian, but it remains a disappointment. The movie offers mild excitement/amusement at best; most of the time it seems bland and lifeless. The Blu-ray provides very good picture and audio along with a strong collection of extras highlighted by two interesting commentaries. This is a fairly nice release for a forgettable film.